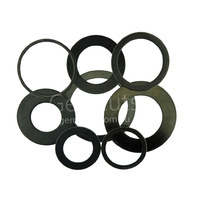 Saw blade bushes for lapidary saws. We stock a wide range of metric to imperial sizes. It is not always possible to get a saw blade with the correct size centre bore hole to match your machine. There is a wide variety of machinery and manufacturers so we cannot stock a matching saw blade for each one. Gemcuts can provide a saw blade bush to convert the bore size of the saw blade to match the arbor on most machinery. The bushes are stainless steel and manufactured to the closet possible tolerance.